Did I mention that I LOVE to crochet? 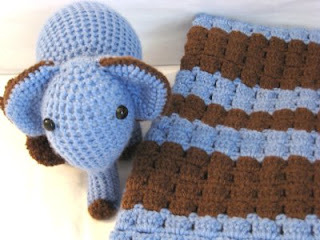 I love to have a reason to make these fun little critters and bubbly blankets. 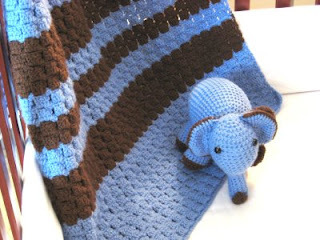 A friend of mine is hosting a baby shower and requested an elephant set in blue and brown. No problem on short notice, right? I've been so busy working in this "Blanky and Buddy" trying to get it done in time for the shower, that I've had little time for anything else. After watching the Toddler wade through empty Diet Coke cans, mix up dirty and clean laundry, turn over a pizza box lid to look for food, and yes, eat a raisin off the floor, I decided it was time for A BREAK from crochet. My house was starting to look like we'd had a frat party. I'm happy to say, it's all cleaned up. The laundry is folded, the trash has been taken out. The Toddler has been fed, and the floor has been vacuumed. Whew! 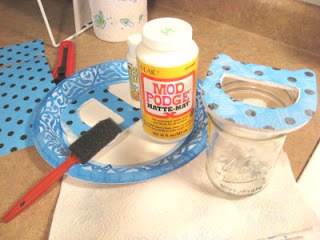 My new found love - Mod Podge. 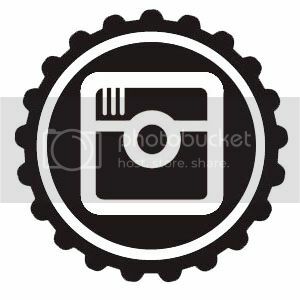 Who doesn't love a monogram? A wooden letter, scrapbook paper, white paint, and Mod Podge. Even Martha Stewart got into the spirit of decoupage. She was Mod Podging butterflies to an egg for Easter on her show this afternoon! Oh my goodness - those are just SO ADORABLE!! Makes me want to learn to crochet!